Printed Bomber Jackets, specifically, floral prints for girls and palm tree prints for boys, are trending in outerwear for spring. For spring/summer 2014, Printed Bomber Jackets for women were on the runways of Novis, Alice + Olivia, and Tracy Reese and on the runways of 3.1 Phillip Lim, Vivienne Westwood and Viktor & Rolf for men. In a previous post I wrote about the versatility of Bomber Jackets and how they can be worn by both genders across all ages, and that they are the perfect transition jacket for your little one for the chilly spring weather. These new Bomber Jackets are nothing like the 90s OPP or Raiders jacket, but are more fitted, slightly cropped, and are Printed! I love Printed Bomber Jackets because they are the perfect juxtaposition of sporty and feminine for girls, and sporty and cool for boys. This H&M Baseball-style Jacket is in shiny, woven fabric with pretty purple floral print and has raglan sleeves in sweatshirt fabric. It also has a zip and welt pockets at front, elasticized hem, and ribbed cuffs. This Juicy Couture GIRLS FLORAL PRINT BOMBER JACKET is baseball chic! Your little princess will look so cute in this Floral Printed Bomber with its banded collar, 4 button closure, slit pockets, and rib trim at cuffs and hem. This Scotch & Soda Kids Quilted Patchwork Jacket takes Printed Bomber Jackets to the next level with on-trend, tropical print mixing and quilted patchwork. It has a short bomber fit, raglan sleeves, zipper closure and cuffed waistband. 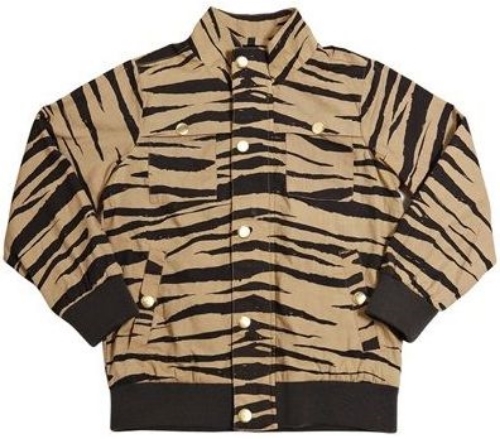 This Mini Rodini ZEBRA JACKET is a cool and light cotton jacket with allover printed zebra stripes. It is made from organic cotton, has a straight fit with zipper at front and two pockets, and has soft ribs at cuffs and hem for perfect fit. This Scotch & Soda Kids Bomber Jacket will have your little dude looking too cool for school wearing this Printed Bomber Jacket. It has an allover palm tree print, "T" patch at left chest, ribbed cuffs, and washed raglan sleeves. This Study Hall Jacket By Andrea Pannell for Go To Patterns is a fun Bomber style jacket for boys and girls. It is an intermediate to advanced PDF sewing pattern with raglan sleeves. Use a medium weight rib knit for the collar, waistband and cuffs and pick out a fun Print for your little one!